BOISE, Idaho -- Gov. C.L. "Butch" Otter aims to build billions of dollars' worth of new and expanded dams as part of his dream of capturing more water in the drought-stricken southern desert of Idaho to irrigate potatoes, grow cities and industry, and flush endangered salmon to the sea. The Republican has asked lawmakers for a $15 million down payment for, among other things, studies to help decide whether a modern era of dam building makes financial sense. Among the projects pushed by Otter is a $502 million dam on western Idaho's Weiser River, upstream from where it flows into the Snake River. The parched climate of the state, where river basins are well behind average snowfall again as winter advances, appears to be adding urgency to the governor's push. "It is a critical investment in our capacity for responsible future growth," Otter told lawmakers Monday, as he began lobbying for the cash. 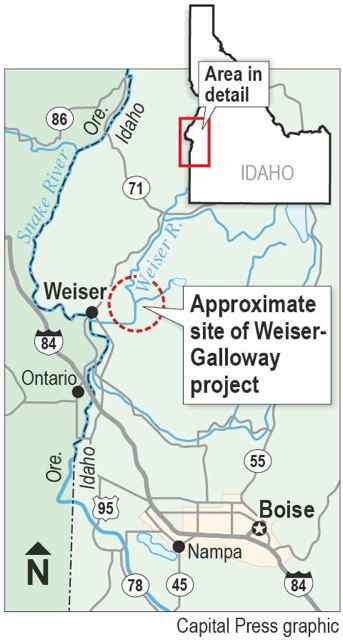 Activist groups are skeptical, saying the Weiser project, known as the Galloway Dam among its supporters, would have been built during Idaho's dam-building heyday decades ago if it made sense. The project got $2 million in 2011 for a study on whether the Weiser area is seismically suited for a dam that could store up to 750,000 acre feet of water -- more than double the capacity of the Lucky Peak Reservoir on the Boise River. The initial conclusion was that a dam would be safe. Now, Otter wants to shift another $2 million to the Galloway project for environmental work and to analyze how a complicated land exchange necessary for the project to go ahead could work. Kevin Lewis of the Boise-based group Idaho Rivers United predicts the spending won't show many results. "Times have changed," Lewis said. "We don't have the money to be running around and building dams just for the sake of building dams." America's dam-building spree lasted 50 years, ending about 1980. Idaho was in the thick of it, from the completion of Idaho Power Co.'s three-dam Hells Canyon Complex on the Snake River by the 1960s to the Teton Dam on eastern Idaho's Teton River that failed spectacularly in 1976 as it was nearing completion. The disaster left 11 people and thousands of head of livestock dead as towns like Sugar City were submersed. Brian Patton, planning bureau chief at the state Department of Water Resources, says naysayers like Lewis shouldn't dismiss new Idaho dams as a dream ill-suited for the modern era. He points to water-storage projects on Washington state's Yakima River as examples of how dams can advance, especially in areas of the West where water is a scarce commodity. On the Weiser River, for instance, a new dam could have multiple benefits, Patton insists, from controlling floods and irrigating crops to producing up to 40 megawatts of clean hydropower. Impounded water could be released to cool overheated Snake River reservoirs downstream -- something Idaho Power is under federal pressure to fix -- as well as help resolve water conflicts on the Upper Snake River, hundreds of miles upstream, he said. There, infighting between irrigators, cities and fish farms has been complicated by a landmark 2004 agreement with the Nez Perce Indian Tribe, with its commitments to flush water to aid salmon returning to the Pacific Ocean. Idaho Power is participating in studies to ensure any new Weiser dam doesn't disrupt existing hydroelectric projects and power generation. "It's all about the timing, and location where water is delivered from," said Kresta Davis-Butts, Idaho Power's operations hydrology leader.